Anderson Eckstein & Westrick, Inc. 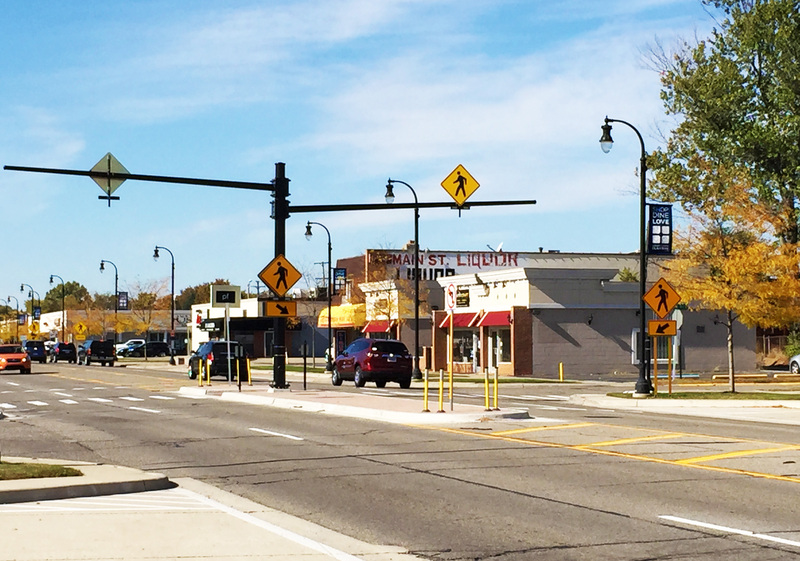 This project consisted of installing three new pedestrian median refuge islands at previously uncontrolled crossing locations along 14 Mile Road in Downtown Clawson. This project was funded by a grant from the Michigan Transportation Alternatives Program (TAP). Each of the three crossing locations incorporate unique improvements designed to make drivers more vigilant while enhancing the safety of pedestrians and bicyclists. Improvements include raised median islands, bump outs, pedestrian hybrid beacon (HAWK signal), rectangular rapid flashing beacons (RRFB), pedestrian countdown timers, pedestrian push-buttons, and marked crosswalks. The raised median islands, in addition to providing a pedestrian refuge, will also help eliminate crossing and turning movements that have historically resulted in a number of crashes. As the City continues to invest and expand their downtown area, there will be additional pedestrian and bicycle traffic that will lead to increased exposure, and by implementing the crossing improvements, the potential for vehicular and pedestrian accidents will be reduced. Services provided for this project. © 2019 Copyright Anderson Eckstein & Westrick, Inc. All Rights Reserved.